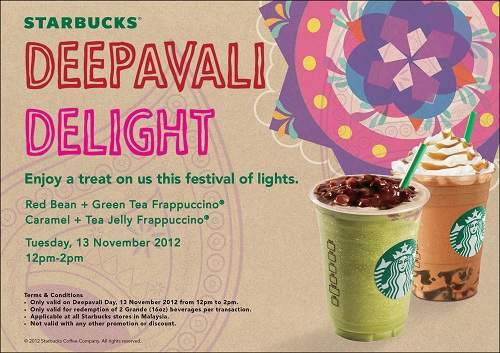 Enjoy a treat on Starbucks this festival of lights! Happy Deepavali to all Hindus in Malaysia! Tomorrow from 12pm - 2pm, Starbucks is treating. All Malaysians get to share the joy in celebration of the Festival of Light. Come, this is complimentary. Starbucks wishes you and all at home, a blessed celebration. ♥ from all at Starbucks. LIKE & SHARE out this great Starbucks treat!